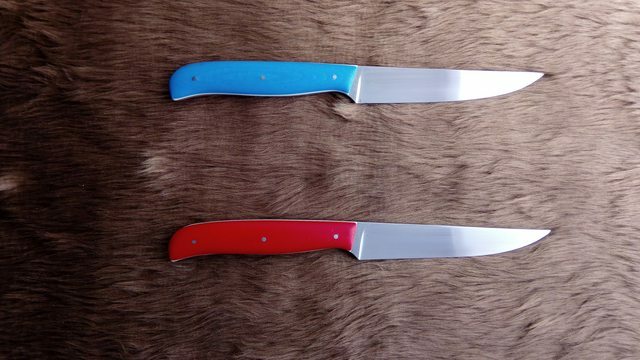 I got the first pair "Patriot" table knives done now so these will become a standard offering with each having the red and blue on opposite sides.. 3mm white G10 liners with 5mm red and blue G10 handles on the 4 1/4 inch 12C27 stainless blades. Have a Sgian Dubh, a JT Ranger and a dagger finished and in the drying rack for now. Bit of a departure from the norm there Gary. Not my taste but looks well executed. Not to my taste either Charles but was something different to try after it was suggested to me by my agent. 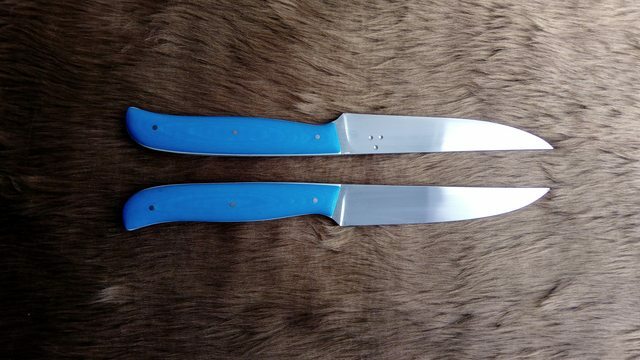 The blades themselves are, although with different handles. Not my taste either, but an absolutely brilliant idea. 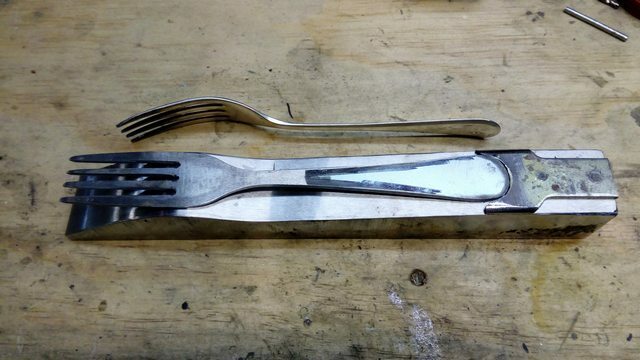 I could see a serious market for those with matching forks. I'm pretty sure they would sell as 4th of July picnic tableware. 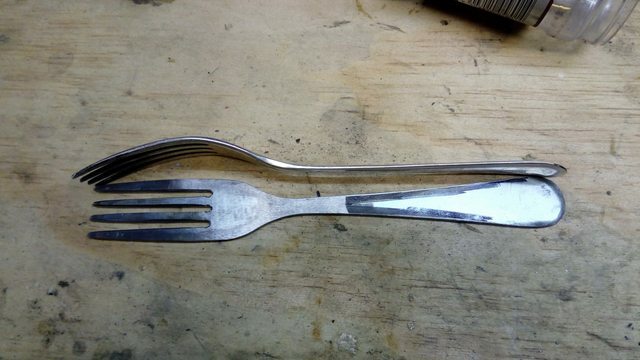 A fork is something I have yet to do but you are correct and I will have to do some experimenting to try that. Make it easy on yourself. 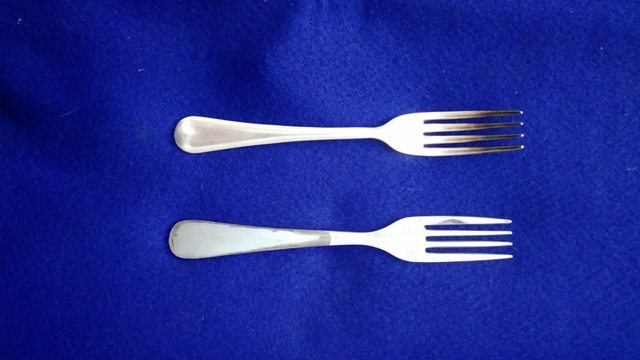 You only need two prongs. Well, you said "experiment" so I figured start with the minimum and work up. Here you go Joshua. 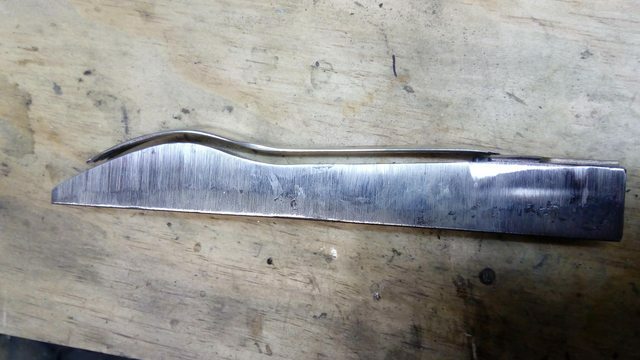 This morning I got a piece of 1/8 in stainless (from an old riving knife off the bench saw) and made up a pattern from one of our english silver ones to see if I could get the prongs cut evenly. 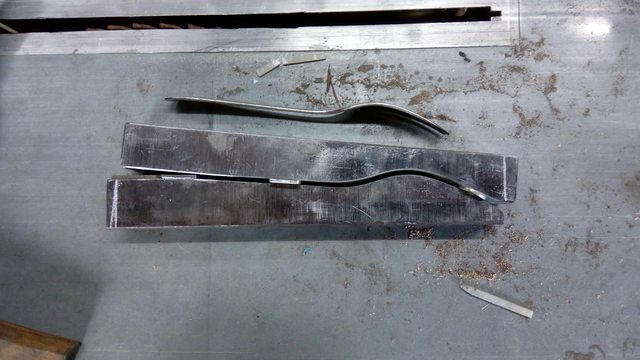 Getting the curve to the fork will be a simple procedure as I will grind the shape on a piece of 1 1/2 square stock for both top and bottom and press the shape in before HT. 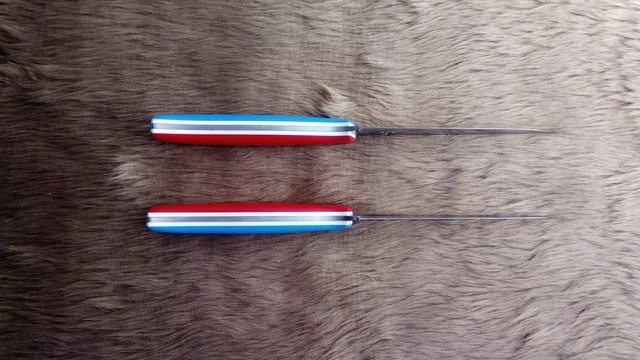 It was the cleaning up of the prongs after cutting them that caused a bit of head scratching but with the slack belt I think I can get it about right. My grinder is running with a belt speed at over 3000 sfpm and it is very easy to get the fork caught and flung away as it did when I was trying it but I have the 2 HP 3 ph motor to be wired in soon with a VFD so I can slow the belt speed right down to about hand sanding pace so the catching effect will be eliminated. I would say that you have done a fine job of it! This was also my trouble when trying multiple tines on a fork. I did find that having a notched work rest, so the rest extended past the front face of the belt helped to support the fork and not roll the inside edges so much. Keep at it man. This is looking great so far. 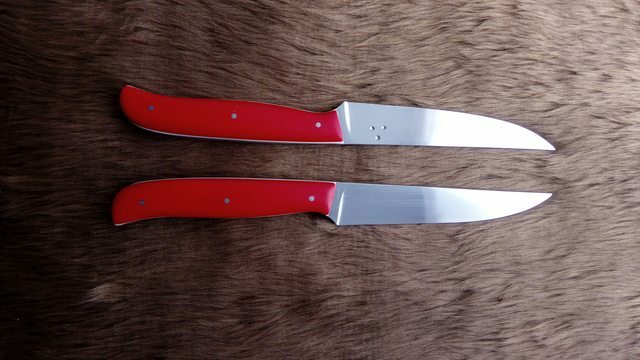 Spent a couple of hours getting the bottom die done for the forks from a length of 1 1/2 x 1 1/2 mid steel, so just have to make the top die now and I can see if they will be a success or whether I have spent time to no effect.